I’ve mentioned a time or two that I’m from Logan, Utah and I know we have a lot of readers with Cache Valley ties. Which means we probably have at least one thing in common…because it’s virtually impossible to visit, let alone live in Logan without visiting El Sol at least once. And if you’ve eaten at El Sol, I’m sure you’ve eaten their chips and salsa. And if you’ve eaten their chips and salsa, you’re probably wondering WHY I’m bringing this up on my blog. My family ate out a lot when I was growing up, especially after my mom died. And before Logan started really growing, our dining options were pretty limited–Fredrico’s Pizza, Angie’s, The Lofthouse Cafe (they had killer burgers and fries, although I’m pretty sure we were the only people who ate there who didn’t also have a naked ladies calendar hanging in their garage), The Factory, Mandarin Gardens, and, of course, El Sol. And we ate at El Sol a lot. Like first-name-basis a lot. Really, it was my only exposure to Mexican food, so I didn’t know that real salsa doesn’t use ketchup as its base. Note: before anyone flames me, let me say that I have nothing but the fondest memories of El Sol and I will admit that while their salsa is notoriously not good, it is strangely addictive. Imagine my surprise when new Mexican restaurants moved into town with their fresh ingredients and fancy green salsa. At first I didn’t want to try it because I thought it would be too hot and because, well, it was green. But pretty soon, I was a convert. 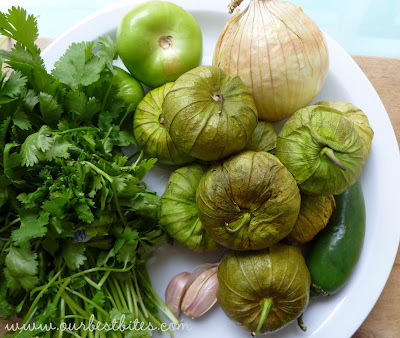 I love the tanginess of the tomatillos and freshness of the cilantro. Because tomatillos taste a little, well, raw (plus SUPER tangy), I toss the tomatillos in some extra-virgin olive oil and roast them to take the edge off and add a little sweetness, but I add fresh cilantro and chopped green onions to keep that fresh flavor. They only roast for about 15 minutes–enough time to do something productive like a load of dishes (or less productive, like a few games of Doodle Jump on my phone). When they’re done, they need to cool for just a few minutes, but they cool off super fast. Just transfer the roasted veggies to your blender jar and add some fresh lime juice, salt, and pepper and pulse it until it’s as smooth (or not) as you want it. After you’ve blended the salsa, transfer it to a serving dish and stir in some chopped cilantro and chopped green onions. Yumminess. And fat free. And almost calorie free. Well, except for the chips. Can’t beat that, right? So what else could you do with it? –Try it in Sara’s Creamy Lime-Cilantro Dressing in place of the bottled green salsa (which, by the way, will never taste good to you again after making this recipe). –Have a salsa bar with this, Garden Fresh Salsa, Pico de Gallo, Mango Pico de Gallo, Grill-Roasted Corn and Tomato Salsa, and Sweet Fruit Salsa with Cinnamon Chips for dessert. –Use it as a marinade for chicken, fish, or pork tenderloin before grilling. –Use it as a dip for your eggs, breakfast burritos, or Overnight Sausage and Egg Casserole. Preheat the oven to 500 degrees. Line a baking sheet with aluminum foil and set aside. After husking the tomatillos, rinse them well in cool water (they can be sticky). Cut the stems and hard portions (if any) off the tomatillos and cut any very large ones in half. 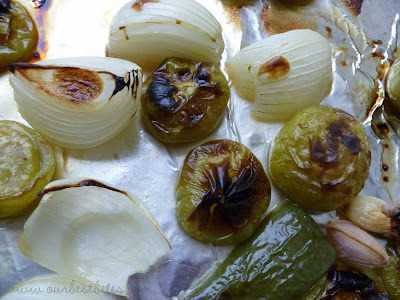 Combine the tomatillos, unpeeled garlic, onion, and the jalapeno on the lined baking sheet. Drizzle with olive oil and toss the ingredients with your hands to make sure they are all well-coated. Place the baking sheet in the preheated oven and bake for 15 minutes. If the vegetables have not charred, turn the broiler on to high and cook for 3-5 more minutes or until the skins of the peppers and tomatillos begin to turn black. Remove from the oven and allow to cool. When the vegetables have cooled, carefully squeeze the skin of the roasted garlic, releasing the soft, roasted garlic clove, into the jar of a blender or workbowl of a food processor. Add the remaining roasted vegetables and then add the salt, pepper, and lime juice. Process until the desired consistency is reached and then transfer to a serving dish. Stir in the chopped cilantro and green onions and serve with chips. not sure where to get tomatillos here in new england ?but i am going to give it a shot so i can try this. your recipes never disappoint! I'm from Logan, and still live here. Guess I've never known you were from Logan too. How fun! Oh, Good old El Sol, the High School hang out back in the day. Guess my palate has changed a lot because I can hardly hack it now, but good memories! Kelli, that's too funny! What high school did you go to? I went to Logan and graduated in '99. The last time I went to El Sol was in '04 when I was pregnant with my first and at that point, I knew I could never go back, hahahaha. This just looks fabulous! I've been wanting to make my own verde, and now I have the perfect recipe (yours always are!) Thanks! Oh Kate that looks so good. SO good. I made a recipe simimlar to this last week, but I added 2 roasted anaheim chiles and about 3 TBSPs of brown sugar. So yummy! Kate, I went to Mountain Crest (I grew up in Providence) and graduated in '97. I could recommend some dishes even. My brother lived in Korea for a few years, so he speaks the language fluently and can navigate his way around the Korean cuisine. He taught me in the ways… 🙂 I just wish I could speak the language too! We went to El Sol so often growing up that I'm sure you and I crossed paths unknowingly at one point or another! This recipe looks so good. I've been reading and enjoying your blog for almost a year now and didn't know you were from Logan. I'm in Logan too. Thanks for sharing all of your delicious recipes! Last time I ate at El Sol was in 2005 and I got food poisoning! JUST made this and it is yummy!! I added an extra lime to see if I could tame the taste just a tad (I have lots of little kiddies). We'll see how they like it! Thanks! Awesome recipe! I've always preferred El Toro to the "el hole" which is what we always called it. And finally someone who will appreciate the humor in the fact that my date took me to Lofthouse Cafe for dinner the night of Senior Ball. Imagine walking into that place in a formal . . .
We went to El Sol just Monday. About the only way to eat the 'salsa' if you can call it that is to get a side of sour cream and guacamole to coat it. We had a Happenings coupon to buy 1/get 1 meal free. I prefer to get the huge tortillas from Bountiful Baskets and make my own sweet pork salad and dressing and salsa. We had the Tortellini Pasta Salad for dinner last night and it is a keeper. Husband LOVES garlic so the dressing was a hit. I love hearing from everybody from Cache Valley!! Evelyn–So small world of small worlds, the people who own the Korean BBQ in Logan bought the house I lived in when I was a kid! And I'm pretty sure that based on your maiden name and proximity of your hometown to Logan, I was friends with some of your relatives. But that's all just a guess… 🙂 Are you related to the Campbell Scientific Campbells? Erin–It HAD to have happened, either at El Sol or The Italian Place! Rachel–I LOVE that your senior prom dinner was at Lofthouse. What a hilarious memory! CiderHouse–I'm glad the salad was a hit! Well, it is funny, but I am not related to any other Campbells in that part of Idaho. Most of my original ancestors moved away to Arizona… which aren't many, since in my particular family line, there were only a two boys in my dad's family, and his brother only had two boys. My family is the only one to have 4 heirs to the Campbell name. I love the area, and that is funny how small the world gets when we begin sharing and communicating! Very cool about the Korean family. They are very nice, although I do not know them by name…my brother might! It had to a Citrus Mahi Mahi my hubby grilled for me. YUM!! Jeri Hastings from Gresham, OR, originally from Chalmette, just outside of New Orleans. I have discovered that my favorite veggie is asparagas, followed closely by brussel sprouts, both of which are grown here in abundance. I bought one of those new George Forman grills with the removeable plates and I take the good parts of the asparagus (compost the other) and put it in a plastic back with Benoit's Best (salt-free) seasoning. You can buy it in New Orleans or get it online at some of the cajun markets. I also add olive oil and parmesian or asiago or some combination thereof. And then just grill them. I use the Forman, but my daughter does them on her big grill. You can add salt and pepper and garlic if you don't have a good seasoning mix. I do the same thing with brussel sprouts. Just cut them in half and cook away. So that's my favorite grilling for the summer. Okay… I laughed out loud when I read about El Sol! I grew up in Logan too and that was my first Mexican food experience as well and how we loved it… I've been back a time or two and cannot believe I liked the salsa… it is Ketchup with a kick! ha ha…I do still love a good Ham & Cheese Salad from Fred's though! Thanks for the recipe, I will definitely try it! I made this salsa today and it was SO GOOD!! I think it's the best fresh salsa I have ever made! I tried another recipe before with fresh tomatillos and it was sour tasting. I think the roasting made it taste so much better. Thank you and keep up the great work!! I love green salsa as well. Thanks for the recipe! My favorite thing I ate this summer was roasted rutabaga fries with season salt and ketchup! YUM!! Corn on the cob with anything grilled! Yummmm. If you can grow tomatoes in your garden, you can easily grow tomatillos. In fact, you can grow them even if you don't want to grow them. I planted a few plants 2 years ago and had buckets of tomatillos. I couldn't eat them or give them away fast enough. I decided not to plant them last year or this year but they still came back! I guess the few tomatillos that fell off the plant that I left on the ground sprouted the following year. I've been making salsa with them for quite some time. I let my jalapenos turn red on the plant (just like letting a green bell pepper turn red if you wait to pick it). I don't think the red does anything to the hotness but it adds a nice splash of color against the green tomatillos. I pulse everything in the food processor so it's about relish size pieces. I don't blend it smooth. Can you can this stuff? I just bought aa TON of fresh produce (if you’ve never heard of bountifulbaskets.org, look it up!!!) and am looking for a few salsa recipes to can. Also, can you can pico de gallo? As far as pico, I probably wouldn’t, just because the whole point of it is the fresh taste, you know? I made this salsa this weekend and it was a HUGE hit! My mom cannot eat tomatoes at all, she is severely allergic, this was a great alternative for her. I used it in the Creamy Chicken Taquitos, which are always awesome, and also in the Cilantro Lime Ranch dressing/dip. This was an incredible meal! We had about 20 people, and everyone loved it!! My mom and sister even decided that they want your cook book, which I have been trying to convince them they needed for a while now! Oh, and I tripled the salsa recipe, and it was ALL gone!! Thanks again for a fabulous recipe, of course I’ll be making it again! This is a fantastic recipe! Thanks so much for sharing. 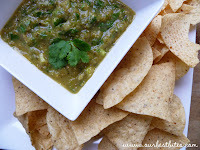 We love tomatillos around here, and we absolutely LOVED this salsa. Oh, how we love, love, LOVE this salsa!!! It is way better than any incarnation of green salsa that we have tried. It is also super easy, so thank you so much! The one thing I changed was how I prepare the tomatillos. They never get unsticky with just water, so I wash them with some Dawn and then rinse them really well. I promise my salsa doesn’t taste like soap! Hi ~ We grew tomatillos for the first time this year. Most recipes I’ve seen online have the roasted veggies peeled before blending. I like that this recipe is simpler and omits that step. Am going to try it out tomorrow. Can you bottle this recipe? I made this tonight for our salsa-loving family and it had a bitter taste to it. Do you have any idea why this might be? I want to try making it again but am not sure what to change. Thanks!